my pointless: want to be short, bald, fat and ugly? try space travel. want to be short, bald, fat and ugly? try space travel. Captain Kirk, Captain Piccard, Luke Skywalker, Hans Solo-- movies have given us the impression that humans-of-the-future who do extended space travel will be strong, virile and handsome. 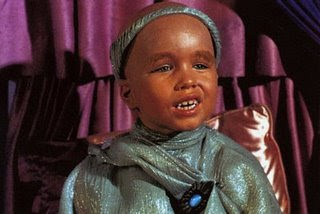 The truth is that they will look more like Balok (Clint Howard's character on the original Star Trek, see picture). In a report that no one can give a reason for, astrobiologist Dr. Lewis Dartnell suggests that if humans do extended space travel, they will become short, bald, fat and ugly. Movement in space does not require much energy at all. It is also not required to keep a body warm. Therefore, humans in space will develop weaker bones and muscles. They will eventually lose shape and stature and become fat. Kirks of the future will have bloated faces because the fluids would pool beneath the skin. Furthermore, Dartnell suggests space travelers will become hairless. This will happen because hair is not be needed to keep the body warm. Since there is not much dust in space, eyebrows and eyelashes will be unnecessary to keep dirt out of the eyes. This may explain why alien life forms are generally ugly, short and hairless.